Yimiton's Blog: Kanye is dying to Marry Kim Kardashian! Kanye is dying to Marry Kim Kardashian! After eight months of battling with estranged husband Kris Humphries, Kim Kardashian's boyfriend, Kanye West, is now putting the pressure on her to speed up the divorce! 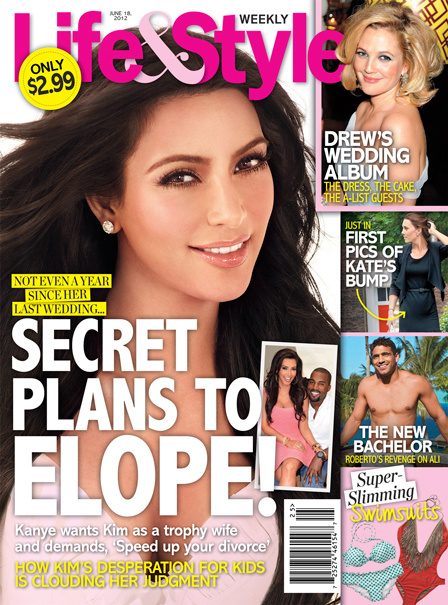 An insider reveals in the new issue of Life & Style, on newsstands now, that Kanye is pushing Kim to give the NBA player whatever he wants to go away -- so the rapper can pursue his plan to marry her! "Kanye wants to marry Kim, and he's telling her to expedite the divorce so they can start their future," a source close to Kim tells Life & Style. "Kanye's like, 'Just do whatever you need to do to make it go away.'" "Kim's starting to come around to Kanye's way of thinking," the insider admits. Kim quickly became serious with Kanye -- publicly calling herself his girlfriend -- and they've even put their LA homes on the market so they can look for a rental together. "As things get more and more intense and comfortable, both Kim and Kanye hate being apart," the insider tells Life & Style. "And as they grow closer, Kanye's desire to marry Kim -- and hers to be married to him -- keeps getting stronger. And while Kim thought her prenup would guarantee a quick divorce, Kim hadn't counted on Kris' demands. A source close to the case says Kris is demanding $7 million to settle, while his team insists Kris wants Kim to admit she married him only for fame and money. Only 8 months after divorce and someone else is already dying to marry her! This girl must be very good at what ever she does! I really do hope it lasts this time if they decide to go down that road.